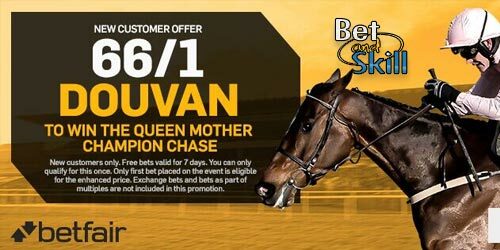 The Queen Mother Champion Chase is the feature race of DAY 2 of the Cheltenham Festival and Betfair are offering a huge 66/1 Douvan to win, plus £100 welcome bonus for new customers! Stake £1, win £66 if Douvan restores his reputation! DOUVAN was unbeaten in 14 races until he was sent off the short-priced favourite in this 12 months ago but ran no sort of race to be 7th. He has not been seen since and in December was initially ruled out of the current campaign as a result of a separate injury. He has recovered more swiftly than expected, however, and seems likely to line up. Get 66/1 Douvan to win the Queen Mother Champion Chase at Cheltenham with Betfair! New Customers can get Faugheen at an enhanced 100/1 to win the Queen Mother Champion Chase . Max Stake £1. Winnings paid in free bets, valid for 7 days, only deposits with cards/Paypal count. Exchange and multiple bets excluded. T&C’s Apply. 18+|Gamble Aware. Register a new account with Betfair before the start of the race (3.30pm) and claim 66/1 Douvan to win the Queen Mother Champion Chase at Cheltenham on Tuesday 13th March 2018 - It's a real bargain!! If the team you have backed wins the match, Betfair will pay out at the quoted price immediately. They will top up your additional winnings within 24hrs. Douvan was unbeaten in 14 outings before last year's renewal. His odds are shortening and he is now only backable at 7/2. His trainer Willie Mullins has recently declared "Douvan is in great form and he did a fantastic piece of work the day of the Red Mills Chase." Betfair are offering all BetAndSkill readers a special price of 66/1 Douvan to win the Queen Mother Champion Chase, click here to get your price boost right now! New customer offer, max stake €1/£1, all winnings paid in free bets, valid for 7 days, only deposits with cards/PayPal count, Exchange and multiple bets excluded. T&C's Apply. Only new players from UK and Ireland are eligible. All the deposit methods count, except Moneybookers, Paysafe, Neteller and Skrill . "Get 66/1 Douvan to win the Champion Chase with Betfair"